Fox squirrel (Sciurus niger) in a tree. Photo courtesy of Adele Hodde, Illinois Department of Natural Resources. Tree squirrels are rodents and are in the same order (Rodentia) as the ground squirrels, mice, rats, voles, muskrat, beaver, plains pocket gopher, and southern bog lemming. Four species of tree squirrels occur in Illinois. All are small mammals characterized by a long, bushy tail, prominent ears, and long hind feet. 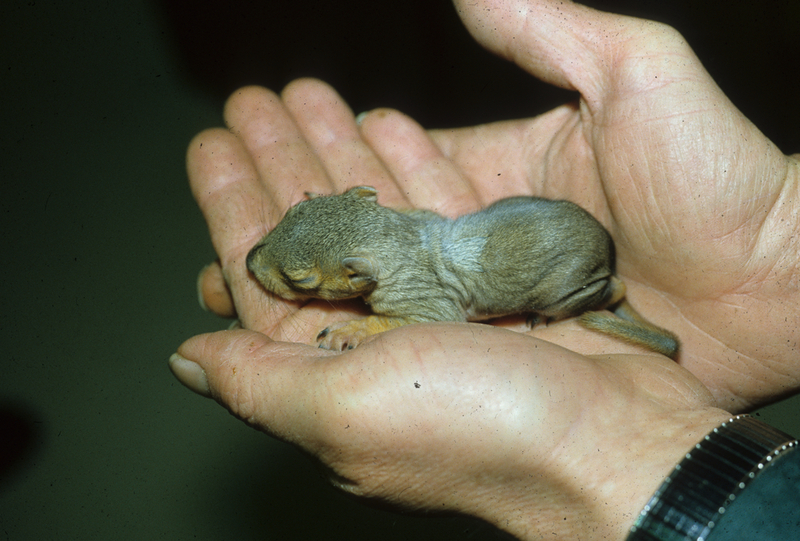 None of the tree squirrels hibernate, but they do have periods of reduced activity during severe cold weather. Fox squirrel (Sciurus niger): The fox squirrel is the largest tree squirrel in Illinois, weighing one and three-quarters to two pounds with a length of 19 ½ to 22 inches. The fur is a mix of rusty-yellow with black with an overall reddish cast. The fur on the ears, belly, and edge of the tail is lighter. Eastern gray squirrel (Sciurus carolinensis): The gray squirrel typically weighs 1 and a quarter pound with a length of 17 ¼ to 18 ¼ inches. The fur is gray on the back and white to light gray on the belly. Melanistic (black) or albinistic (white) variants occur in Illinois. For example, melanistic individuals can be found in Fisher and Gibson City and albinistic individuals are common in Olney and in northeastern Illinois. Red squirrel (Tamiassciurus hudsonicus): The red squirrel is smaller than the fox or gray squirrel, weighing approximately two fifths of a pound with a length of 11 ½ to 13 ½ inches. The fur is reddish gray on the back and whitish on the belly. Ear tufts are present in winter. This species has a restricted range in Illinois. Red squirrels are found in the northeastern counties of the state. Southern flying squirrel (Glaucomys volans): The southern flying squirrel is the smallest tree squirrel in Illinois weighing approximately two ounces with a length of eight and five eighths to nine and three quarters inches. The fur is glossy gray to cinnamon on the back and white on the belly. The eyes are large and the tail is flattened. This squirrel appears larger than it is because of the folds of skin on either side of the body that extend from the wrist to the ankle. This feature gives the squirrel its gliding capability. All four tree squirrel species are found in wooded areas. 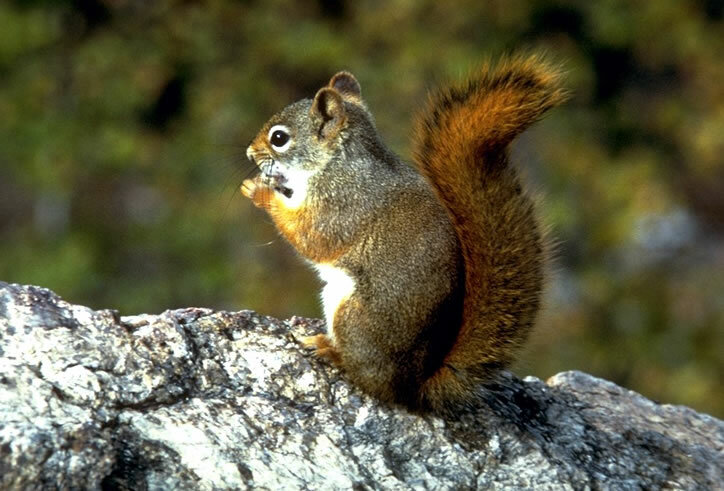 Fox squirrels inhabit the forest edge or wooded areas with little understory. Gray squirrels inhabit mature forests with understory. Fox and gray squirrels are common in towns and cities, especially in parks and residential neighborhoods. Red squirrels prefer dense stands of pine trees but also inhabit mixed forests or oak, maple, hickory hardwood forests with dense understory. 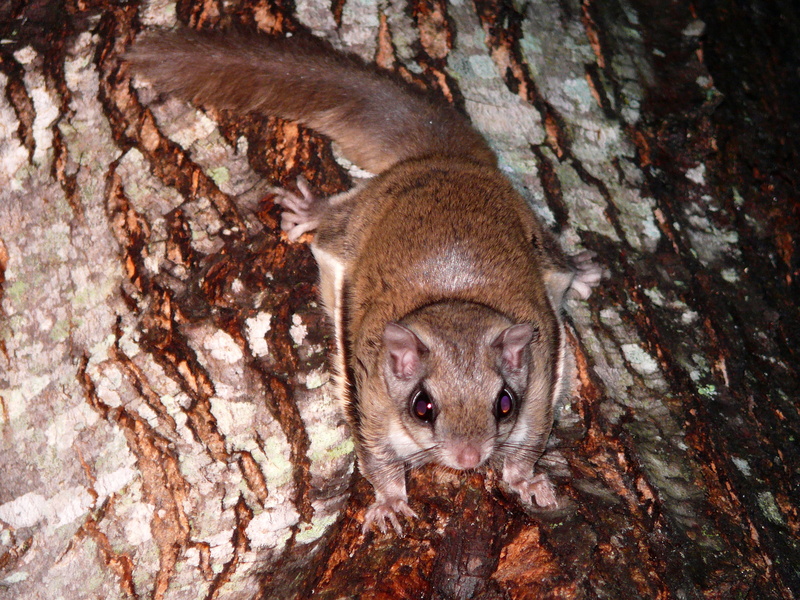 Southern flying squirrels inhabit hardwood forests with mature trees and nearby water sources. Fox squirrels are common throughout Illinois, even in urban areas. Loss of mature, wooded habitat has decreased the population of gray squirrel in Illinois, although they remain common throughout the state and are locally abundant in urban areas. Red squirrels are found only in the northeastern part of the state, particularly along the Kankakee and Iroquois Rivers. Southern flying squirrels are found throughout Illinois but are most abundant in southern Illinois. Each squirrel species has two breeding seasons, one in winter (January and February) and the other in late spring (March) or early summer (July). Female fox and gray squirrels that are at least two years old have two litters per year, younger females have only one litter per year. Average litter size is two to four (southern flying squirrels may have litters of up to seven young), with young weaned around eight weeks of age. Fox, gray, and southern flying squirrels have similar food requirements. In fall and winter, acorns, hickory nuts, osage orange fruit and walnuts are important food sources. In winter and early spring, squirrels may eat tree buds or bark if other food is scarce. Both fox and gray squirrels cache (store) food for later use by burying it. Fruits, berries, and corn are important summer food sources. Squirrels will also eat insects and other animal matter. Flying squirrels will eat bird eggs or nestlings, and scavenge for other animal matter when it is available. Red squirrels depend heavily on coniferous trees for buds and seeds from cones, but otherwise eat a diet similar to that of the other tree squirrels. They cache their food in small holes or cracks in the bark of trees. Fox, gray, and red squirrels are diurnal meaning that they are active during the day. Southern flying squirrels are nocturnal and are active at night. All tree squirrels are active year round, although they will take shelter in their nests during extreme cold weather. Fox and red squirrels spend more time on the ground than gray squirrels. Due to the extra skin on their sides southern flying squirrels are able to glide from tree to tree, but are not able to fly as their name suggests. All tree squirrels are solitary; however, since they are not territorial many may be seen in close proximity to each other, particularly if there is a good supply of food. The young often stay near the female until the next litter is born. Nests in tree cavities are preferred, but when cavities are not available squirrels will build nests of leaves in trees. Like most rodents, tree squirrels have a relatively short lifespan. Most live only a year or two. 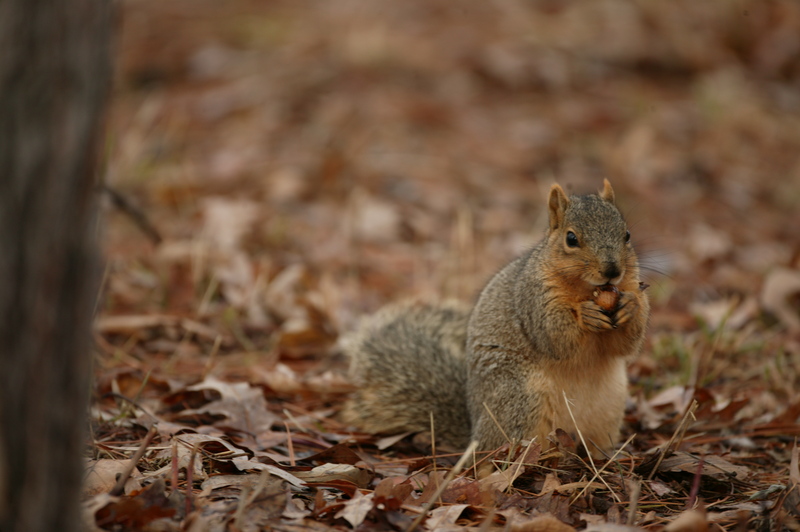 Hawks, owls, foxes and coyotes all depend on squirrels as a food source. Squirrels are excellent climbers and jumpers. They are well known as unwelcome guests at birdfeeders. Besides consuming seed, they may damage bird and wildlife feeders by chewing on them. They may also occasionally damage lawns when caching food for the winter. They will also sometimes damage garden plants, particularly corn. While inconvenient, these behaviors can usually be handled by modifying the habitat or excluding the squirrels. In urban areas, squirrels may cause substantial property damage when they chew through siding or enlarge openings to gain access to attics. Once inside a building they may do further damage if they chew on insulation or electric wiring. Squirrels may also cause power outages when they short out transformers. It will likely be necessary to use several techniques to control property damage by squirrels. Exclusion is typically the most effective method when dealing with squirrels. Since squirrels can jump up to 10 feet, trim tree branches back at least that distance from buildings to prevent squirrels from accessing the roof. If squirrels are a problem around bird feeders, provide corn for the squirrels away from the bird feeders or use bird feeders with squirrel-deterrents. Using baffles or greasing birdfeeder poles with Vaseline or cooking oil can help prevent squirrels from climbing up to the feeder. To prevent squirrels from climbing on isolated trees or power poles, attach a two-foot wide metal collar around the tree or pole six feet off the ground. On trees, attach the metal collar with wires held together with springs to allow for growth. Regularly check buildings on the property for places that need repair. Repair holes and openings as soon as they are noticed, making sure not to trap animals inside. If holes are found, loosely stuff newspaper in the opening. If the paper has not been moved, it is safe to proceed with repairs. Try this for two or more days until none of the holes are being reopened. There are a couple of taste repellents that can be used to discourage squirrels. Capsaicin is a readily available repellent made from red peppers. It can be used to treat birdseed to discourage squirrels from raiding bird feeders. Capsaicin does not affect birds and is safe to mix with birdseed. Ro-pel is another taste repellent that can be effective at discouraging squirrels. It may be applied to seeds, bulbs, trees, shrubs, fences, siding and outdoor furniture. 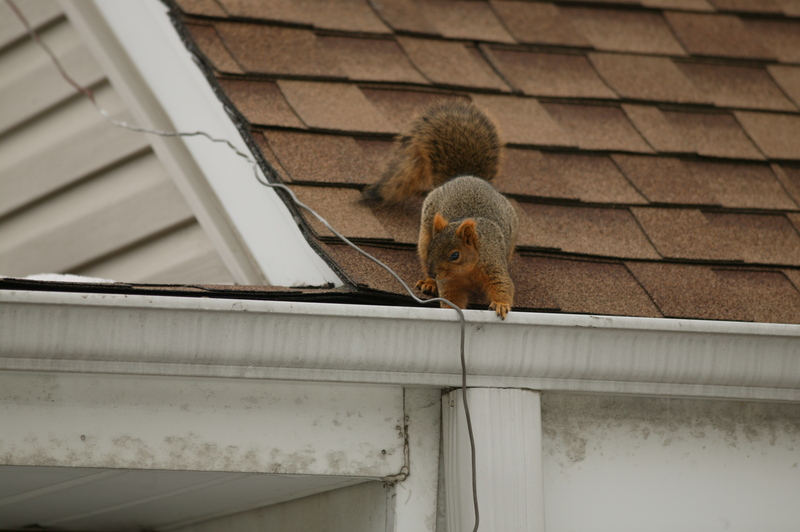 Placing a light (mechanics or strobe) or radio in the attic may temporarily discourage squirrels from using the area, but once they become accustomed to the device it will no longer be effective. Sometimes a squirrel will chew its way into a house or garage. If this happens, it will be necessary to remove the animal before it damages insulation or wiring in the structure. Many times the squirrel will leave if windows and doors to outside the house are left open during the day and human activity inside the room(s) is limited. If squirrels are inside the building and will not leave, set live traps to capture them for release outside or install a way-one door over the opening so that animals can leave but not enter the building. An 18-inch long section of four-inch diameter plastic pipe pointed downward at a 45° angle can be placed in the access hole instead of a one-way door. If the opening is large, heavy wire mesh (1⁄2 by 1⁄2 inch) can be placed over the opening. Once all animals are out of the building, repair the opening. If you are going to trap a squirrel (even if it will be released onto the same property), you will need a permit from an Illinois Department of Natural Resources District Wildlife Biologist. If you need assistance with removing a squirrel from a building, you can call a nuisance wildlife control operator who will trap the squirrel for a fee. 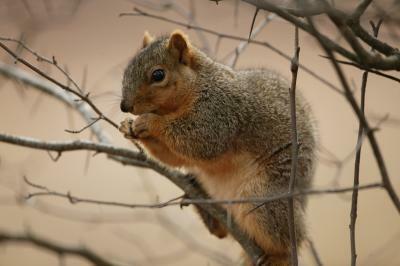 Tree squirrels in Illinois are not considered to be a public health concern. They can be carriers of various parasites, but none have serious public health implications. It is common to see squirrels with patches of fur missing. Hair loss in squirrels can be caused by mange or fungal disease. Mange is a disease caused by microscopic mites that burrow under the skin. The squirrel mange mite (Notoedres sp.) has been reported in both fox and gray squirrels. There have been no reports of this type of mange being transmitted to humans or domestic pets. Loss of hair, and dark, thickened skin are symptoms of mange in squirrels. Mange can be spread by direct contact between squirrels. Adult squirrels in good condition typically survive mild infestations, but severe infestations can be fatal. Additionally, infected squirrels with a lot of hair loss may die of exposure during the winter. Another possible cause of hair loss in squirrels is fungal disease. 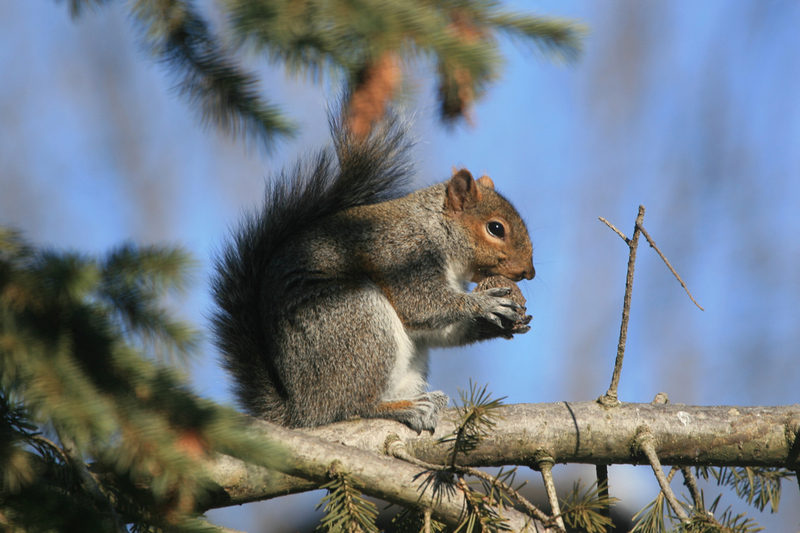 A variety of fungal diseases affect squirrels. The fur of infected squirrels will break off at the skin leaving patches of skin that appear to be bare. Otherwise healthy squirrels will recover from fungal infections. Tree squirrels play an important role in forest regeneration. Squirrels bury tree seeds and nuts as a way to cache food for use later in the season. However, they do not return for all of the seeds/nuts that they bury, and some of these later sprout and grow into trees. Squirrels are also an important part of the food web, being preyed upon by several species of avian and mammalian predators. In Illinois, tree squirrels are protected by the Wildlife Code. Fox and gray squirrels are protected as small game species. 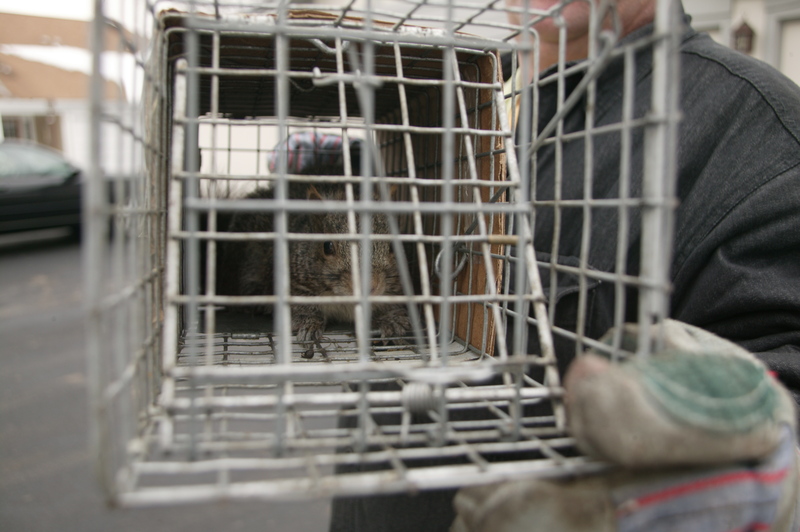 In urban areas, squirrels may be trapped and released if an animal removal permit is issued by an Illinois Department of Natural Resources District Wildlife Biologist. If you plan to release the squirrel, it is recommended to release the squirrel five to ten miles away. You must have permission of the landowner before releasing the squirrel(s). In rural areas, a hunting license is needed to harvest fox and gray squirrels. Hunting red squirrels or southern flying squirrels is not allowed. Fox and gray squirrels may be hunted from August through January except during the firearm deer season. For full hunting regulations visit the IDNR Licenses & Hunting website.